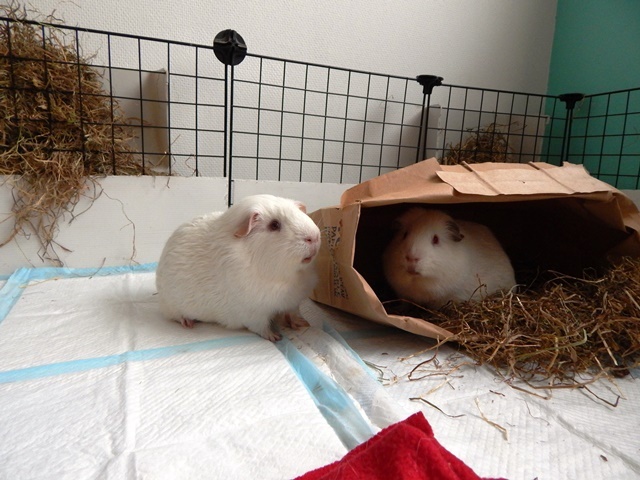 Dear readers, I’ll start by apologising for the lack of interviews for the past two weeks: apparantly the respectable guinea pigs are on vacation. But we are coming back today with an inter species interview with Georgia the Bunny! And of course it’s me taking the interview because I’m the only one with vast knoweledge of bunny language. I’m smart, ain’t I? Kirk: Hi, Georgia! You are the first bunny to interview for our blog. Could you tell us something about you just to break the ice? Georgia: My name is Georgia the bunny. I am about nine years old, and live in Sudbury, Ontario, Canada, with my human, Heidi, and two boy guinea pigs, Mr. Horatio Daisy and Mr. Joshua Dandy. 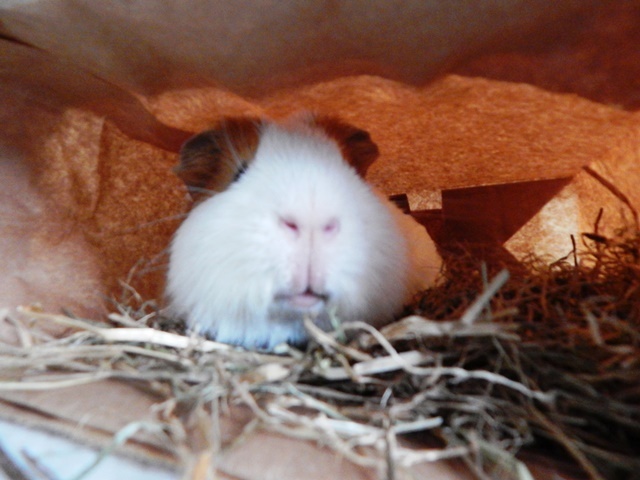 Because there are no girl guinea pigs around, they like to chase me. Ugh! Kirk: How did you meet your humans and convince them to take you home? Georgia: I met Heidi at Pet Smart, where the SPCA (a Canadian rescue organization) had a display set up. 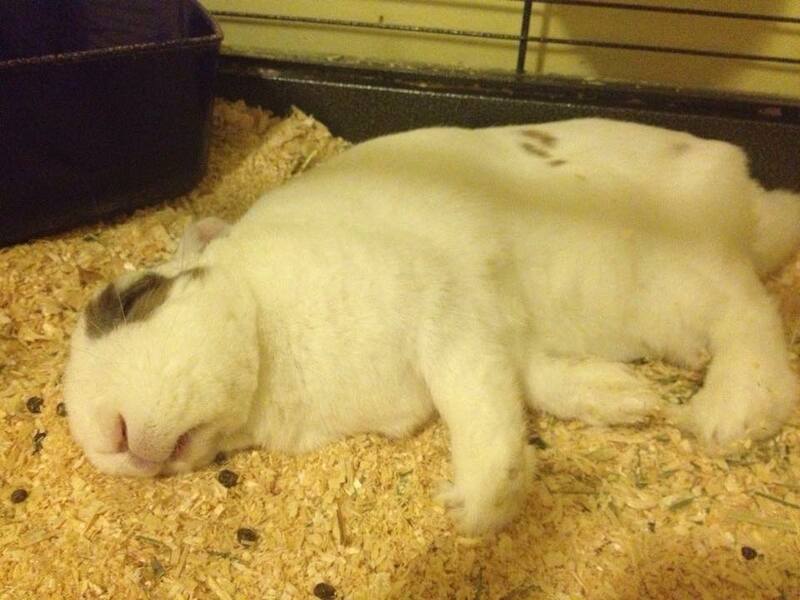 I chinned her to let her know she was mine. Heidi brought back her mom and sister to see me, and none of them could resist me. Heidi filled in an application, and came to pick me up a day later. I kept jumping out of the box in the car on the way home. LOL! That happened at the beginning of 2007, by the way. Kirk: What do you think about Heidi? Is she a good human for you? Georgia: I like Heidi because she is a bunny person, and appreciates us over other animals, such as cats. She had a bunny when she was young, named Whitetoe. Heidi also shares her banana with me when she is eating breakfast, and gives me snuggles. I have become quite cuddly in my old age. Kirk: What is your favourite activity? Tell us more about a day in your life. 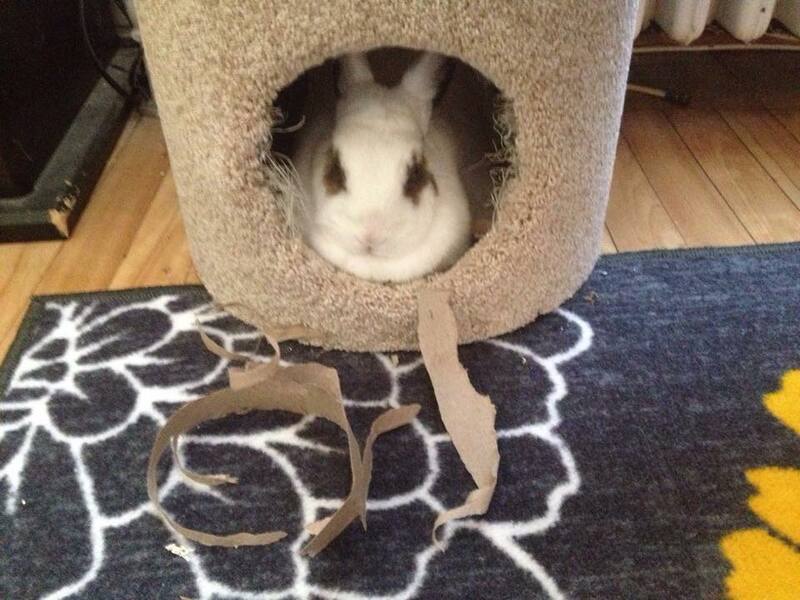 Georgia: I like hanging out in the living room, and bunstructing the inside of my cat house. Even though I am old in bunny years, I enjoy running around and binkying sometimes, especially after I get out of my palatial cage. 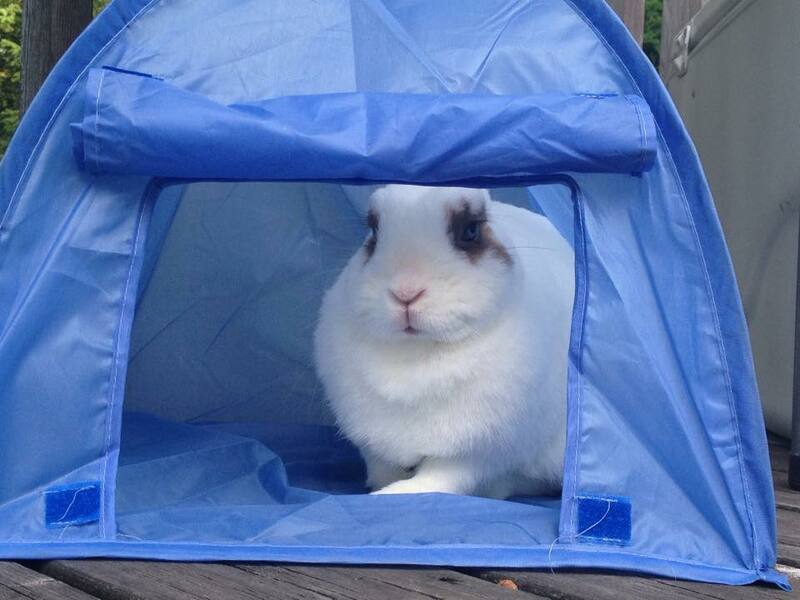 Heidi just got me a bunny sized tent at the dollar store, and I think it is awesome. I am especially using it this week, as I am at the cottage with the whole family. My favourite thing to do is jump back in my cage, which is several feet off the ground. I never miss! Kirk: What do you think about humans in general? Georgia: I think humans are OK, even though they are not furry! Kirk: Do you have other furry friends? 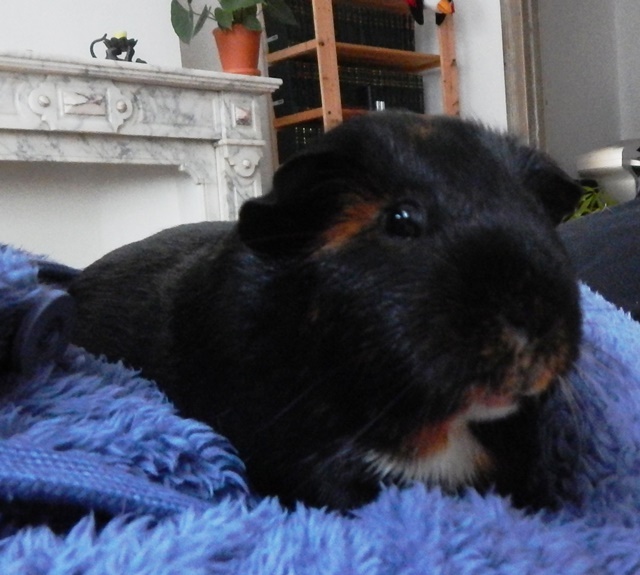 Georgia: Heidi used to have two female guinea pigs, Poppy and Cinnamon. They would get scared when she let us graze in the grass, and they would try to hide in my fur. I was OK with them. 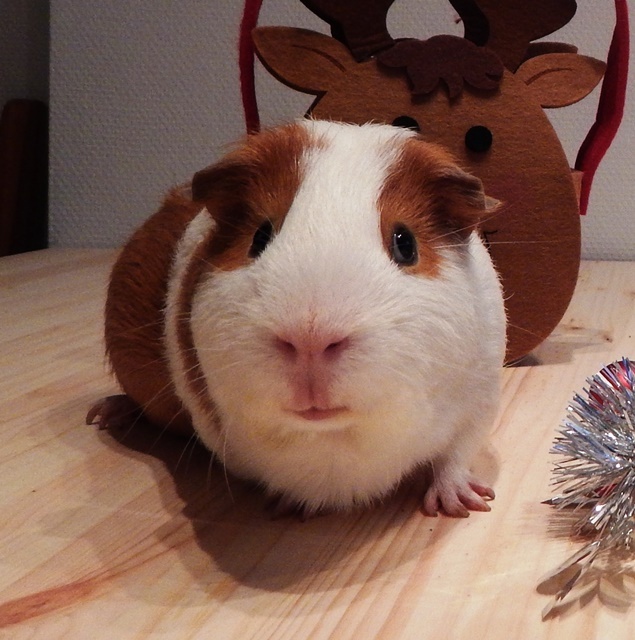 But then she got these boy guinea pigs! I am not fond of them, as they think I am girlfriend material. Not impressed! Kirk: Tell us something funny about your human? Georgia: I think it is funny that Heidi has such an array of clothes to keep her warm in any weather. She should just have a fur coat, like me! Georgia: One time, when I was a young bun (Heidi brought me home when I was six months old), Heidi was forced to chase me with a broom to catch me. I loved to play chase back then! Not so much now. Kirk: Anything else that you would like to add. Georgia: I appreciate this opportunity to spread the word for bunny-kind. This Sunday started normal, with the hf coming out from the bedroom a little bit too late for our breakfast. Moreover, she insisted weighting us before giving the veggies. We are somehow used with this, so we said nothing. 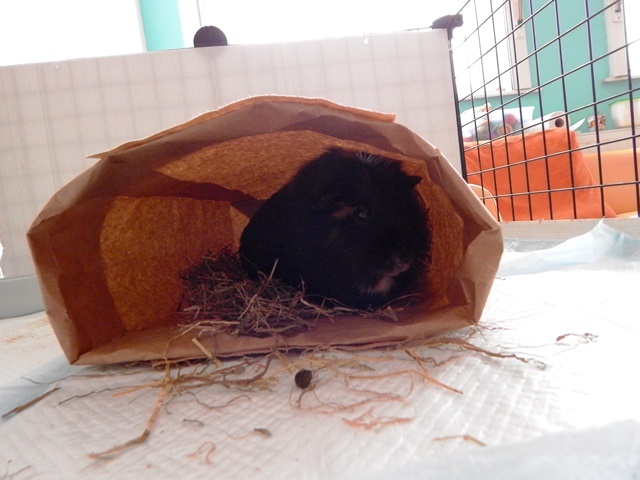 Then the baby asked for attention and we continued our life with some sleep, roaming around and other guinea pigs’ activities. Kirk and I were the first for the bath. But she tried to fool us by taking us in the garden while she cleaned our room. And then she took Kirk. I’ve tried to help him, but it was useless. In 10 minutes she was back for me. The tunnels were also taken and instead all of our effects we’ve got some paper bags. Outrageous! So, this is how we’ve spent our Sunday? How about you? P.S. We are hoping to get back our houses and tunnels by latest tomorrow morning. Could you sign a petition to help us?